All the members are on their way home. 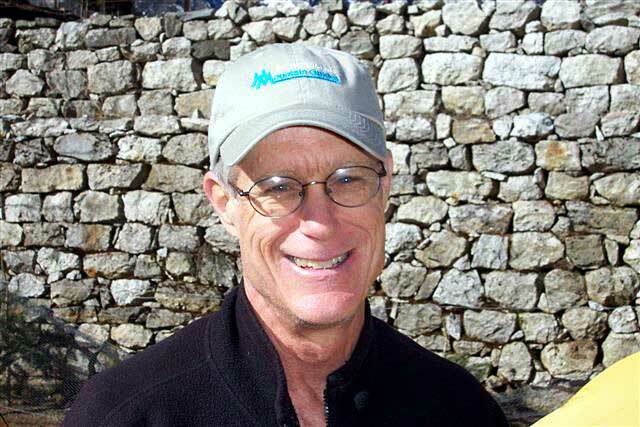 Tucker, Jangbu, and Hahn are heading for Namche today. 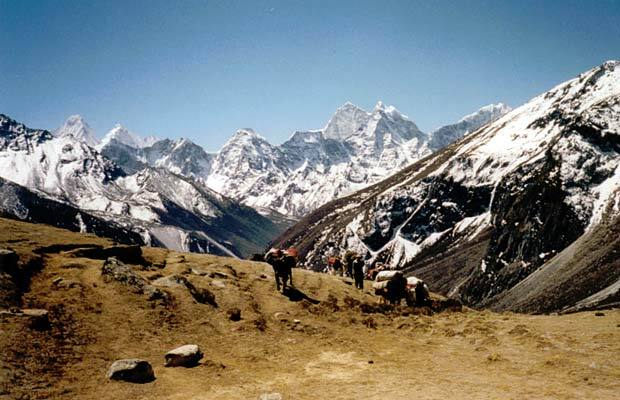 The last IMG loads are off the mountain, the sherpas are all down, and the final gear is being packed up at Base Camp. Much of it will be stored at IMG's storeroom in Pangboche for the autumn IMG trips in the Khumbu and for next year on Everest. Before IMG can get the eleven thousand dollars ($11,000) that we paid for garbage deposit returned to us (for the two Everest permits and one Lhotse permit) all the human waste needs to get buried in the soil at Gorak Shep, the burnable garbage goes to the incinerator in Namche, the recyclable items go to Kathmandu, and the oxygen cylinders will all be re-exported to the USA. We are very pleased at how the 2007 expedition turned out. With 37 IMG summits, including 15 of our members, that is nearly 75% of our customers on top for the second year in a row. 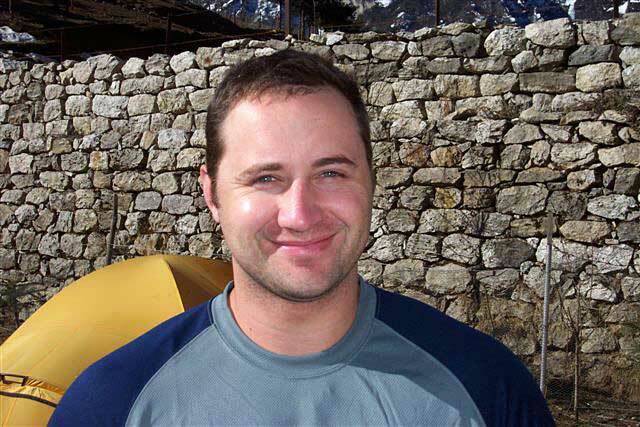 We are also pleased that the 2007 Everest season has ended on an "up" note for a change  with the successful rescue of the Nepalese climber by Hahn, Grom, Haugen, and Phinjo. Every year we go to Everest it is different, and we never know how it will all end up. This remains a very challenging climb, and it is only with the hard work of all the team members and IMG staff that we have a chance at success. Thanks to all the people that made this a good year  including our team members, leaders, guides, sherpas, Kathmandu staff, and the IMG team back in Ashford office. 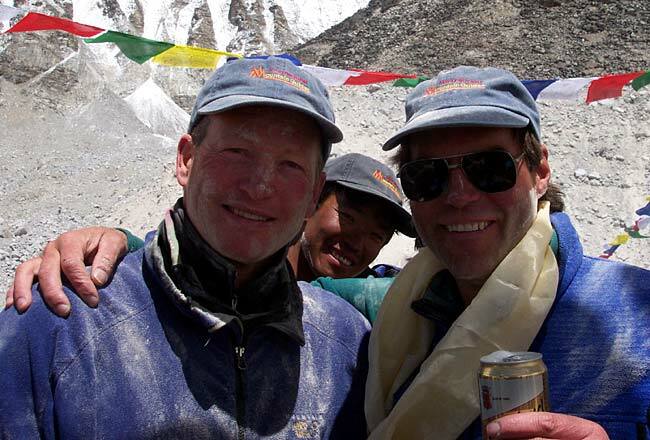 Now its time for a short break to savor the end of the trip  soon we will start preparations for the 2008 Everest climb! Ang Jangbu reports that yesterday Passang Nuru, Ang Karma, Phinjo and Tshewang made a final trip up to the Col and carried down the remaining Camp 4 loads and Phinjo Dorje and Tsheten Dorje brought down the rest of Camp 3. 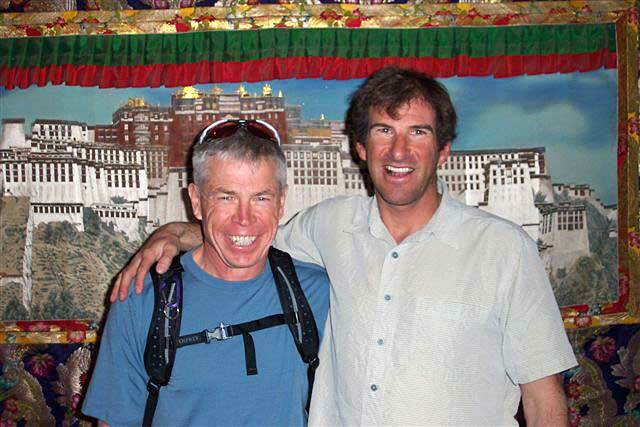 IMG has also sent two sherpa to help the body retrieval team tomorrow (of a Nepalese climber killed on Lhotse). 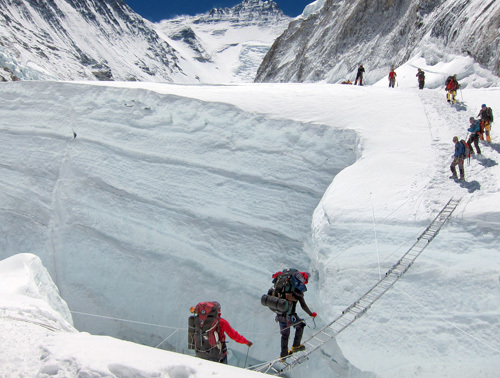 Meanwhile, another group of IMG sherpas made three trips between Camp 2 to Camp 1, bringing down all but about 15 loads to the top of the Icefall. Meanwhile, aother group of sherpas shuttled loads from Camp 1 down to BC. We expect all the gear to be off the mountain after two more days. We have 60 yaks arriving BC in the evening of 26 May. 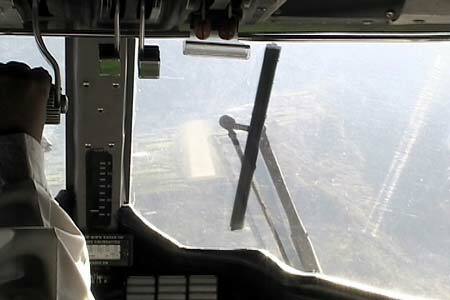 We have tentatively booked the heli charter out of Syangboche on 29 May. Tuck, Dave and I are hoping to leave base camp on the 27th. 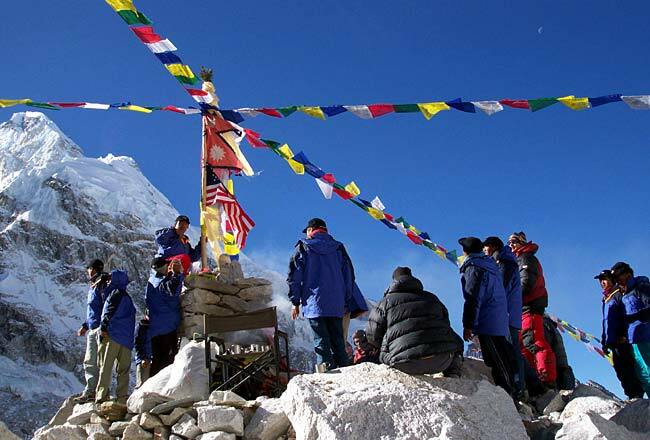 This is to notify that the following members of 2007 IMG Everest Expedition II have reached the summit of Mount Everest this morning at 8:15 am. I'm happy to say that our final summit bid was successful today, with Yau Choon and Jamling Bhote reaching the summit and returned safely to the Col. All other IMG members have now descended to Base Camp. We are still waiting to get the whole story from Dave, Casey, and Mike on the big resuce yesterday of the Nepali female climber (not a Sherpani) from the Nepal Democrat Expedition. We'll let you know when we hear more. 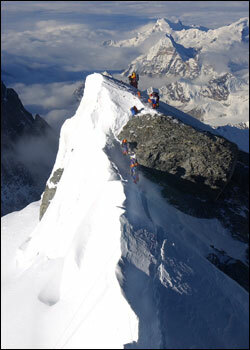 This morning we had our first five Sherpas climbing back to the Col to start carrying gear down. Some of the members who descended a couple days ago have already started hiking out from BC now. Over the next several days the Sherpa team will remove the camps and start packing up the gear. We won't relax, though, until all the people are safely off the mountain. Mark Tucker reports from Base Camp that all is well with the IMG team. Dave, Mike N., Mike H., and Casey have descended to Camp 2. On the way they helped a climber from another team, who had been abandoned at the Balcony (27,500',) and who was in very bad shape. 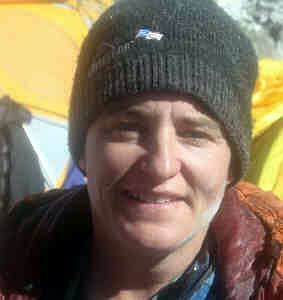 They managed to get her to Camp 3, where she was turned over to climbers from the Everest Expreme (medical research) team. We are proud of these guys for doing a great job on the way up, and the way down! IMG Guide Dave Hahn, who just became the 2nd western climber to have summited Everest 9 times (still tied with George Dijmarescu,) has a long history of leading some of the most difficult rescues in mountaineering history. 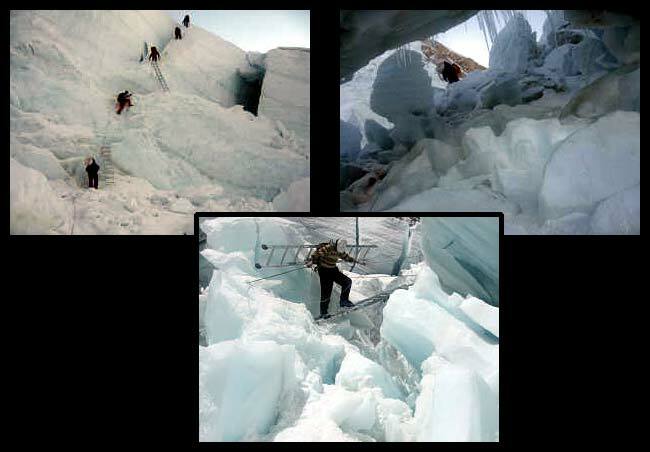 Among them is the highest known rescue of five climbers on the North Ridge of Everest just below the summit in 2001 for which he and three other IMG guides received the David A. Sowles award. You can also read Dave's own account of that rescue. Ang Jangbu reports that Haugen and Casey are heading down from Balcony right now, and Nixon is approaching Balcony on his way down. Hahn is on the summit waiting for the crowd to come up the Hillary Step. Congrats on #9! 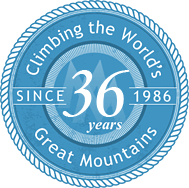 35 IMG SUMMITS and counting! Congrats to the climbers! Everyone who was up high the last few days is on their way to BC in the next day or two. Mark Tucker reports that the third IMG summit team (Casey Grom, Mike Haugen, Mike Nixon, Dave Hahn and their Sherpas) are doing great, and are now above the South Summit  they should be on top within the next hour. The weather is staying good! 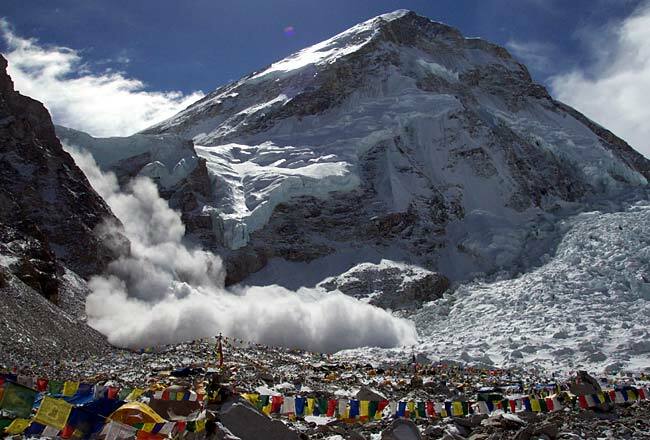 Tucker and Jangbu report that all climbers from yesterday have safely returned to the Col, and several of them have descended further down to Camp 2. Tomorrow's summit climbers have now made the move up to the Col from Camp 3, and are getting ready for their summit bids tonight. So far so good! 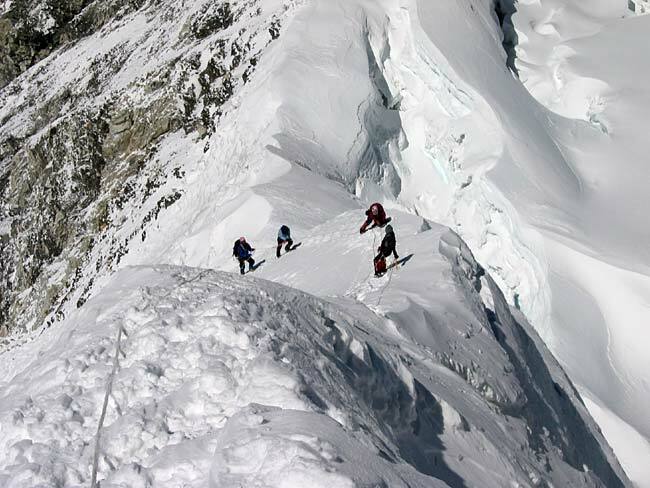 Mark Tucker reports that Ryan, Sam, Russ, Panuru, JP and Kami have summitted and have started down. Fernando/Samduk Dorje and Nat/Dasona are above the South Summit heading for the top. 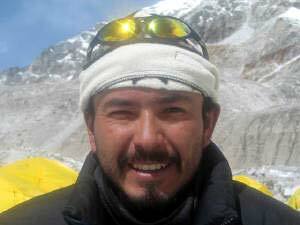 Mingmar Sherpa is also climbing with the group. Weather is good. Mark Tucker reports that the climbers have reached the Balcony, and are now continuing, except for JR, who has turned back to the Col (he is OK). The weather is reported to be good. We will expect to hear again from them from South Summit or thereabouts. 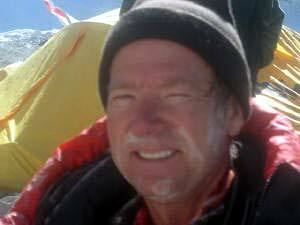 Mark Tucker reports that the seven members on the second summit bid, and their sherpa team, all left the South Col within about 15 minutes of each other, starting about 9:30 pm (Nepal time.) We will expect to hear from them when they reach the Balcony. The weather is reported to be good, so we'll keep our fingers crossed! 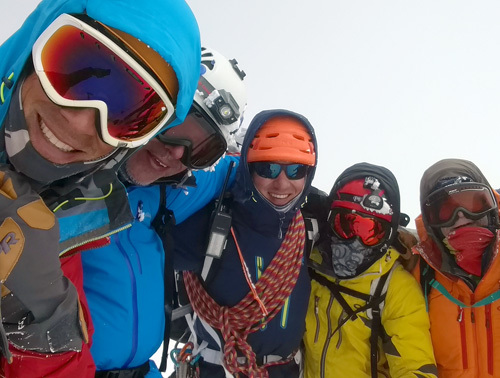 Ang Jangbu reports that the first summit team all made it back to the Col OK, and that Benjamin/Danuru and David/Dorje Lama continued their descent to Camp 2. The second summit team of Ryan, Sam, Russ, Nat, J.P., J.R., and Fernando along with Panuru, Dasona, Kami, Dawa Nuru and Samduk Dorje all made it up to the Col in good shape (before noon) so they will have plenty of time to rest and re-hydrate up there this afternoon in preparation for their summit bid tonight. 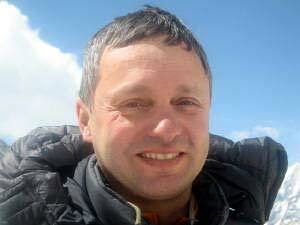 Mark Tucker reports from Base Camp that Benjamin and Danuru reached the summit at sunrise and have already started down. The weather is reported to be good. Jim Waldron and Mingma Tshering with Al Hancock and Passang Rinjing are at the Hillary Step and Andre Bredenkamp with Ang Namgya are at the South Summit. Dave Schlimme and Dorje Lama have turned back and are on their way back to the Col.
Lower down, the second IMG summit team at Camp 3 are rolling out of their tents to get ready to go to the Col today. 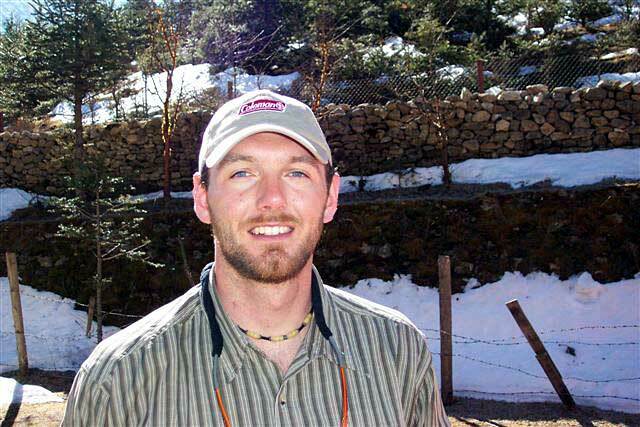 Mike, Casey, and Mike Nixon are headiing to Camp 3 today and Dave Hahn is going to Camp 2. Tim started up but now has returned to BC. Tucker reports from Base Camp (he is sleeping in the comm tent) that the first team has reached the Balcony and everything is OK. They left the Col before 10pm and some of the climbers reached the Balcony before 2am and some after 2am. The weather seems to be good. IMG leaders Tucker and Jangbu report that the weather appears to be holding and the first summit team is on the way! They left the South Col a little while ago and are now climbing to the Balcony. Climbing tonight are: Benjamin/Danuru; Jim Waldron/Mingma Tshering; Al Hancock/Passang Rinjing; Dave Schlimme/Dorje Lama; Andre Bredenkamp/Ang Namgya and in support (carrying additional oxygen to the Balcony) are Ang Pasang, Mingma Tenzing, Nima Karma, Tshewang Lhendup, and Phinjo Dorje. So far so good  we'll keep you posted!! Ang Jangbu and Mark Tucker report that Al, JW, Benjamin, Dave S, Andre and Sherpas Pasang Rinzing, Mingma Tsering, Danuru, Dorje Lama, Ang Namgya have made it to Camp 3. Mike N. went back to Camp 2 and will try again in a couple days. Tomorrow the plan is that they will move up to the South Col, where they will be joined by support climbers Ang Pasang, Mingma Tenzing, Nima Karma, Tshewang Lhendup, Phinjo Dorje, and Ang Karma (who will be the South Col water melter). 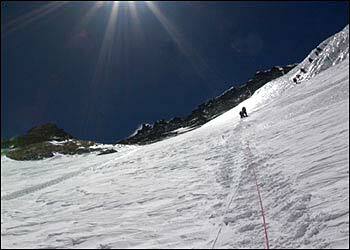 Also climbing to the Col tomorrow (and going back to Camp 2) are Chebbi, Lhakpa Bhote, Ramji, and Ang Nima. Tomorrow we have Ryan, Sam, Russ, Nat, J.P., J.R., Fernando going to C3 along with Panuru, Dasona, Kami, Dawa Nuru and Samduk Dorje. Haugen and Grom head for C2 in the morning. Tim and Phinjo will start up tomorrow. SO, everything is set for the first summit bids  let's keep hoping the weather stays reasonable!! 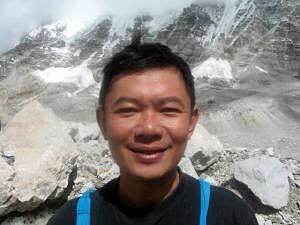 Ang Jangbu advises that we now have six sherpas at Camp 2 with 11 more moving up tomorrow to support the summit bids. 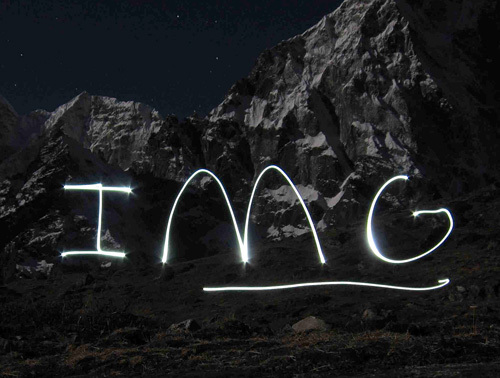 The first IMG summit team (Andre, Mike Nixon, Benjamin, Dave Schlimme, Jim Waldron, Al) leaves Camp 2 tomorrow for Camp 3. Meanwhile Nat, J.R., J.P., Ryan, Sam, Russ, Frenando, will rest at C2 for a day. Casey and Mike head from BC to C1 tomorrow. Congratulations to the summit climbers today. The door is open a crack! Ang Jangbu and Mark Tucker report that all of the IMG team's moves went smoothly today. Tomorrow five more team members start up: Ryan, Sam, Russ, JP and Nat. Their tentative plans are to go to Camp 2 direct, but may stop at Camp 1 depending on how it goes. Mark Tucker and Ang Jangbu report from Base Camp that the weather seems to be improving and that the first summit bid has now headed up. We have six sherpas moving to Camp 2 today in support, and they will go to Camp 3 tomorrow to dig out those tents. 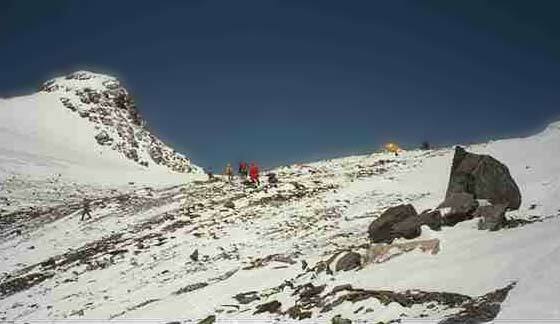 Five sherpas are also carrying to 2 today (Camp 3 and 4 food.) Two sherpas are at Camp 1 right now shoveling out snow around the tents before the members get there. Today we have Benjamin, Fernando, Dave Schlimme, Mike Nixon, Andre Bredenkamp, Jean Ricard and Al Hancock going to Camp 1 and Jim Waldron heading to Camp 2. Five more climbers are tentatively heading up tomorrow on the second team. Keep your fingers crossed for good weather. We'll keep you posted! 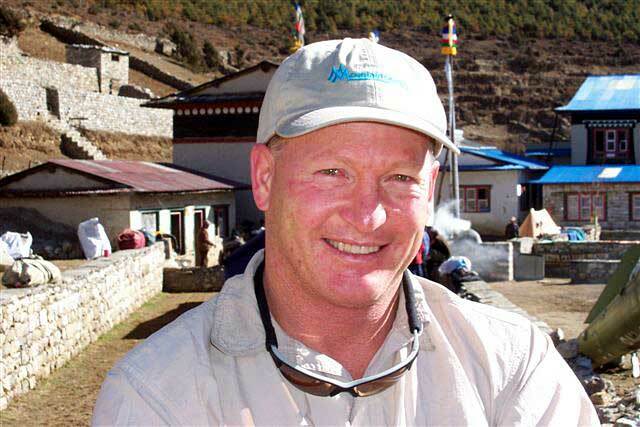 IMG Leaders Mark Tucker and Ang Jangbu Sherpa report from Base Camp that the weather has taken a turn for the worse and the first summit bid has been postponed for a few days. Yesterday there was a big windstorm that came through that caused a lot of damage to some groups. Fortunately, IMG's cooks Bale and Sante at 21,000 foot Camp 2 did a great job keeping the kitchen/dining tents from blowing away. We are continueing to monitor the weather closely, and as soon as things are looking better, it will be time to start the summit bids. In the meantime, the team is at Base Camp eating yaks steaks and doing some power resting getting ready for the big push! They wish everyone back home a happy Mother's Day! IMG Leader Mark Tucker reports from Base Camp that most of the IMG climbers have now returned after their forays of R & R down valley. Everyone is doing OK, despite the ubiqutous Khumbu cough caused by the dry air. In the past couple days, IMG's Mingma Tenzing and Tshewang Lhendup overnighted at the Col and fixed to just below the Balcony. 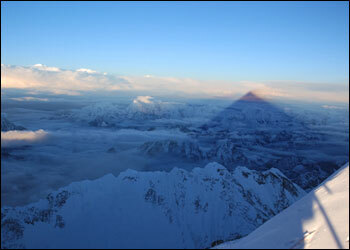 The first summit team is now slated to leave for Camp 1 tomorrow, with a possible summit by May 16th, weather depending. We'll keep you posted on the members involved in this bid when we get the final roster. Another big day for the sherpas. We now have 94 bottles (@1800L) on the South Col. Six more sherpas are scheduled to carry again tomorrow with camping gear. The last few IMG team members are on Camp 3 rotation. Some are now headed down valley today and more tomorrow. Meeting at HRA today for fixing above the Col  tentative May 8th sleep at Col and fix to the Balcony on 9th. IMG Leader Mark Tucker reports from Base Camp that today was a big one for the IMG team, with 18 of our sherpas making carries to the South Col, and 18 more carries to the Col scheduled for tomorrow. IMG climbers Ryan, Sam, Russ, Tim, Al and Dave S with their sherpas Panuru, Phinjo, Passang Rinjing and Dorje Lama are back to Camp 2 after overnighting at C3 and we currently have Mike N, Mike H, Casey, JP, JW, JR, Nat, Fernando and Benjamin en route to C3 over the next couple days. 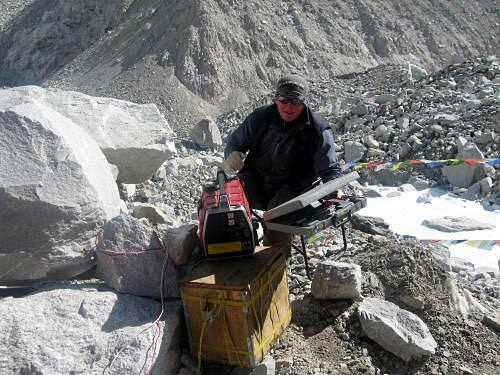 IMG leader Ang Jangbu Sherpa reports from Base Camp that the route to the South Col is in! IMG Sherpas Danuru and Pemba Dorje supported the Ice 8000 Sherpas yesterday and ended up fixing the last 400 meters of rope into the Col, where they claimed the site of IMG Camp 4. 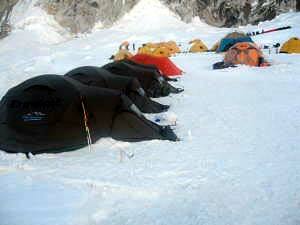 Tonight we have six members and four sherpas sleeping at Camp 3. The rest of the Sherpas are all at Camp 2 now and will be carrying to the Col over the next couple days. Most of the IMG team members are now either at Camp 2 or will be there in the next couple days, to do their overnight acclimatization rotation at Camp 3. Three IMG sherpas carried into C3 today and six more will carry to C3 tomorrow. 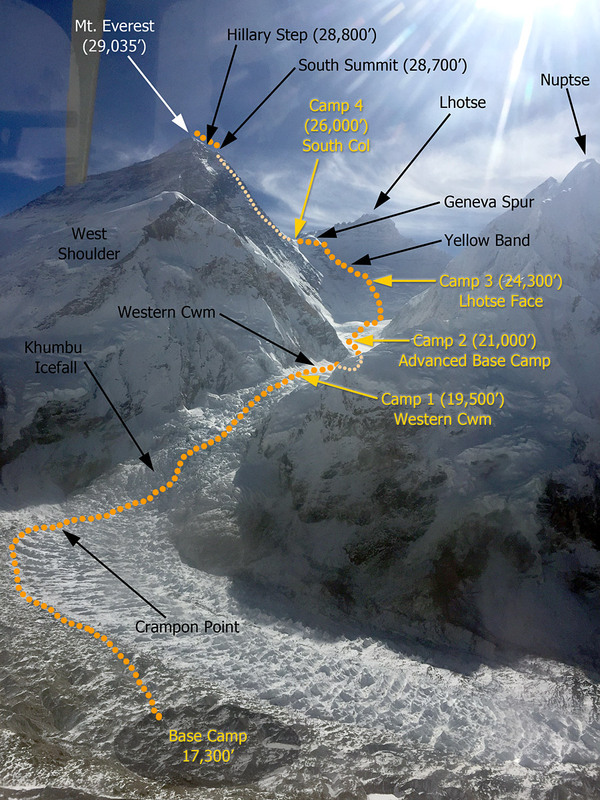 Ang Jangbu reports that the Ice 8000 sherpas are now moving up to finish the fixing into the Col, and the rest of the IMG sherpas are now moving to Camp 2 in preparation for carries to the Col. Everest was summited yesterday from the North by five of the Himex sherpa team, fixing the summit ridge. Congrats to them  we hope to not be far behind! Camp 3 Sherpa team set up six tents and got up some of the needed supplies. Carries to the South Col are still a ways off and maybe pushed back even further because the team who was planning to fix into the Col is now heading down. Sounds like not a whole lot left to fix so we are now talking with Ice 8000 team and may get involved with them to get it done. 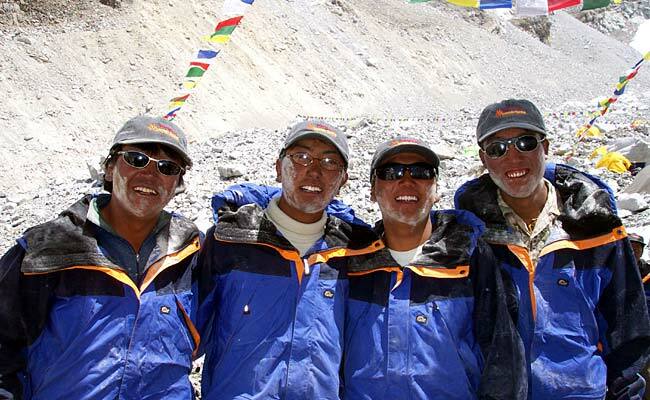 On the IMG team, four members go to C1 tomorrow with their personal Sherpas. Pemba cooked cinnamon rolls for snack and pizza for dinner. 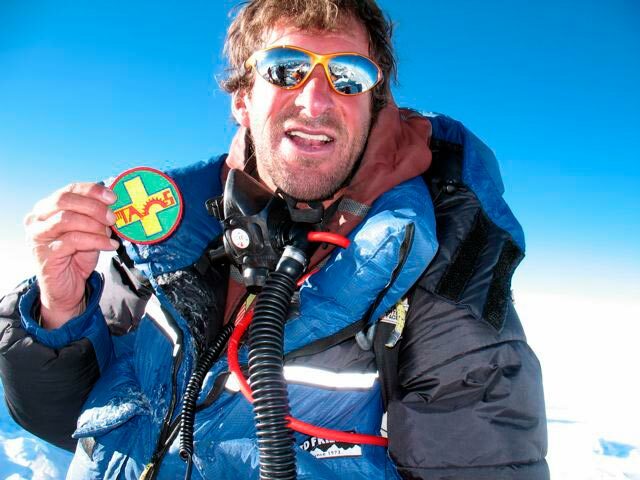 Talked to Brice on the North Side, and his fixing team went up to 8500m today and may continue to summit tomorrow. 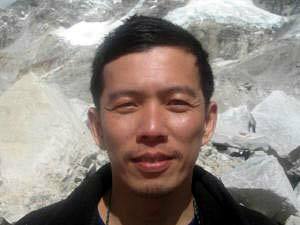 Helicopter removed remains of sherpa from base camp this morning. Ang Jangbu and Mark Tucker report from Base Camp that the SPCC agreed to hire additional sherpas to work with the Icefall Doctors. Good timing, since a collapse in the "popcorn" section (about 1/3 of the way up) yesterday shut down the route for the day. Additionally, there was snow and wind yesterday  not a good day for climbing. Now, the route has been successfully repaired, and seven members of the IMG team and their personal sherpas were able to go all the way to Camp 2 today. Joining them at Camp 2 are Phunuru, Mingma Tenzing, Nima Karma, Tshewang Lhendup, Phinjo Dorje and Samduk Dorje who are getting ready to start initial carries to the South Col. 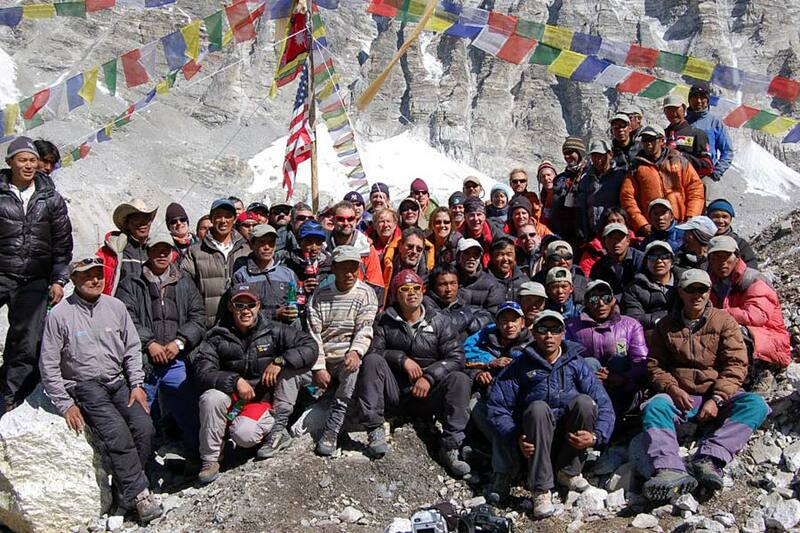 The rest of the sherpas carried Camp 2 today. 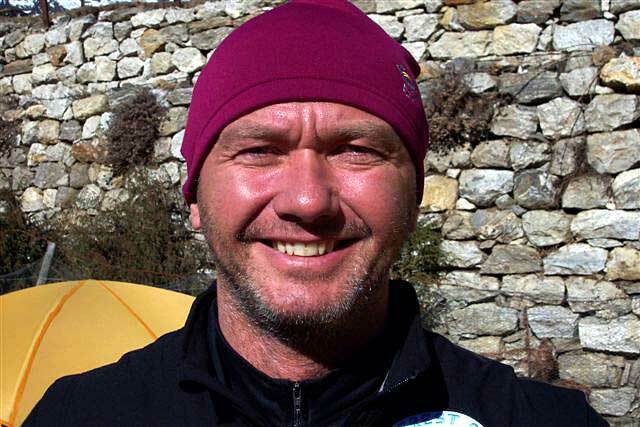 Sad news from the day before yesterday when a sherpa from another team was killed near the base of the Lhotse Face. His body was brought down to BC today with help of sherpas from various teams, including our IMG Sherpas who were carrying to Camp 2. 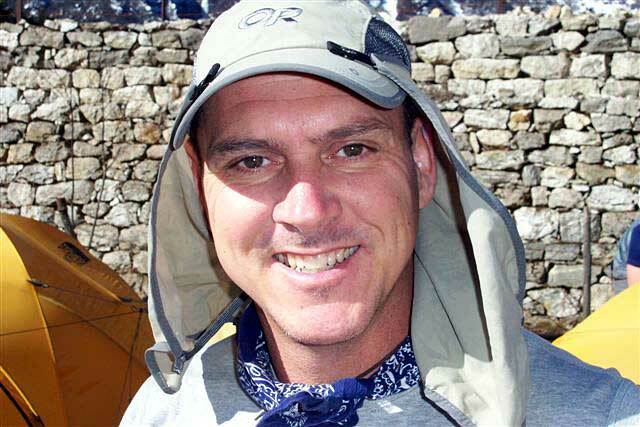 IMG Leaders Mark Tucker and Ang Jangbu report that rope fixing on the Lhotse Face continues to go well. IMG sherpas installed more ropes above Camp 3 and now the sherpas from other teams have taken over and have made it to above the Yellow Band, and should be to the Col very soon. IMG sherpas all came down yesterday for a rest at BC after a big week of work. 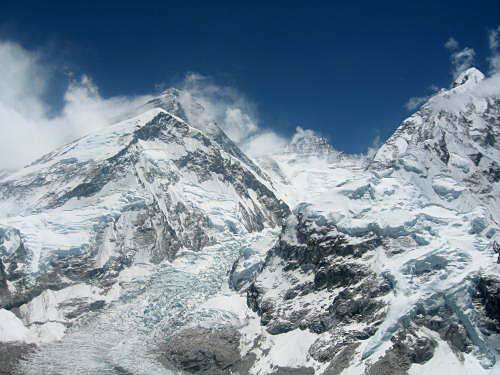 Tomorrow we will have 22 sherpas carrying to Camp 2. The plan is to send about 6 sherpas to Camp 2 to sleep on Friday and to finish putting in Camp 3 on Saturday and Sunday. 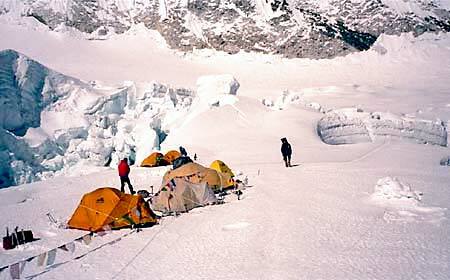 Then, the rest of the Sherpas will be moving to Camp 2 on Sunday to try and put in South Col next week. The goal is to have the Col stocked by early May, then pull the Sherpas down again to give them a good rest break, then be ready to pull the trigger on summit bids, weather permitting, any time after about May 10. Today at BC there is a meeting with the SPCC representative and the leaders from many of the teams, with the goal to try to get SPCC (the organization responsible for the icefall route) to commit to hiring more Icefall Doctors, to improve the route. 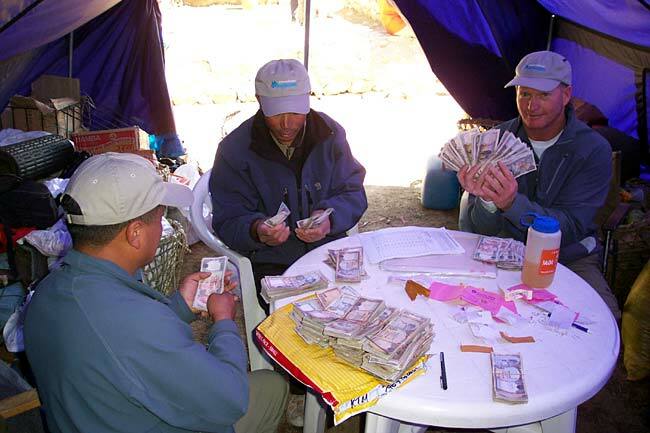 SPCC has collected a LOT of money form the various expeditions teams (IMG alone paid $8400 in icefall fees), and the teams want to see the money spent on the route maintenance!! IMG team members continue their acclimatization rotations to C1 and C2, and everyone is doing well. The climbers will be ready to start doing the Camp 3 rotations next week, once C3 is finished. 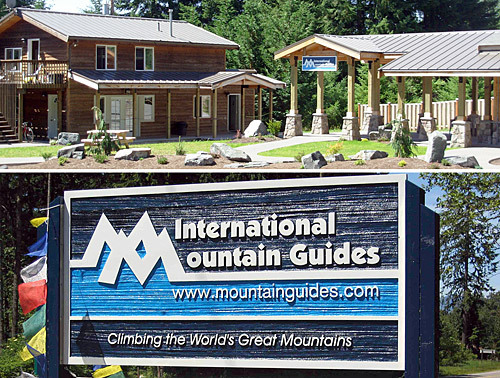 The Camp 3 climbers left BC this morning. Attached is a shot at base camp this morning with their guides Mike Haugen and Casey Grom. Ang Jangbu and Mark Tucker report from BC that the IMG team members are continuing their acclimatization runs to Camp 1 and Camp 2, and several have now tried out the route on the lower Lhotse Face. 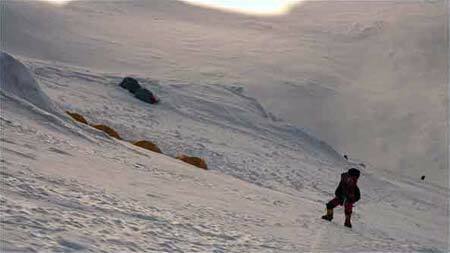 The IMG Camp 3 climbers have now returned to Base Camp. 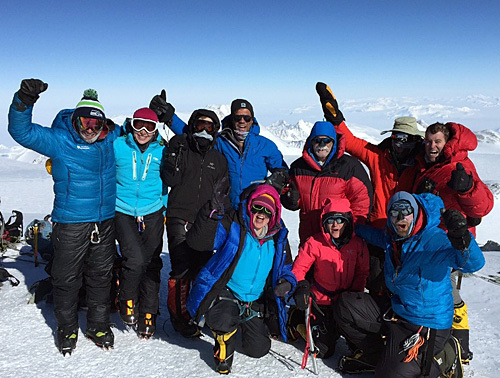 Congratulations to them on their "summit" on the Lhotse Face! 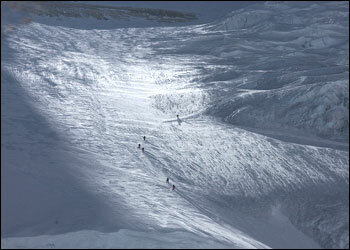 This is steep and icy, and you look directly up at the summit of Everest, 7000 feet above... very specacular climbing! Meanwhile, the IMG Sherpas continue to build our Camp 3, and Mingma Tenzing and Nima Karma fixed another 200 meters of rope above Camp 3, as the route gets pushed towards the Col. Seventeen loads of food went to Camp 2 yesterday, in preparation of the increased occupation of that camp by the climbers and Sherpas, as the "action" starts to move higher on the mountain! IMG Leader Mark Tucker reports that our Sherpas finished fixing the route to Camp 3, established the IMG camp, dug out some platforms, and carried some equipment to begin supply C3. Camp 3 is a very uncomfortable and unpleasant camp  with spindrift commonly sweeping down the Lhotse Face from above and piling up over the tents. Now that the site is established, there is still a lot of chopping and digging necessary to excavate additional tent platforms. These tents will be used by the climbers and the personal sherpas on the next acclimatization rotation, and on the summit bids for an overnight en route to Camp 4 (South Col). 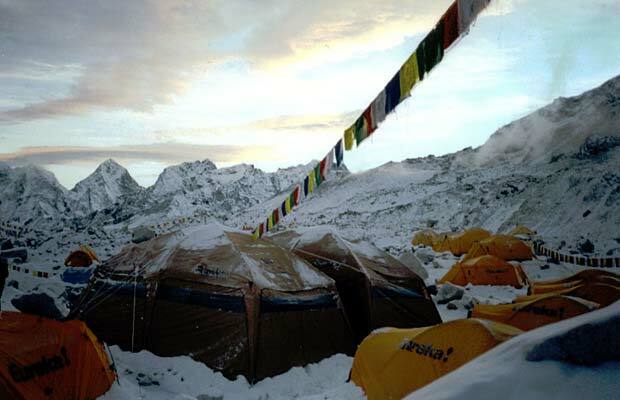 The Sherpas generally skip Camp 3 when they go to the Col  they will not stay there if they can avoid it! Ang Jangbu Sherpa reports from Base Camp that both big kitchen/dining tents are now erected at Camp 2 and that the five IMG Sherpa members of the Lhotse Face fixing team made good progress today, reaching the site of "lower" Camp 3, about 200 meters short from our Camp 3 site. It was snowing pretty hard in the afternoon, so they turned around at 2pm and will go back up again tomorrow to finish fixing to 3 and stake out our site. The Camp 3 climbers, with Casey and Mike, are on their way up to Camp 1 to sleep. Ang Jangbu Sherpa reports from Base Camp that South African climbers Andre Bredenkamp and Mike Nixon arrived BC on schedule today. The IMG team continue their acclimatization rotations to Camp 1. The next several days will see a lot of equipment moving up the hill, as Camp 2 continues to be established. 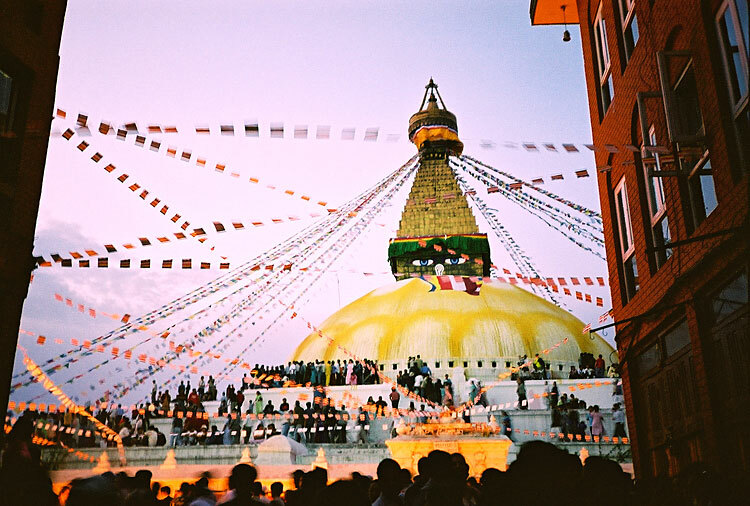 Tomorrow, Karma Rita, Ang Namgya, Danuru, Samduk Dorje, Phu Tashi, Phur Temba, Karma Serki, Chebbi, Jenjen, Lhakpa, Gyalzen Dorje, Kalden Phura, Tsheten Dorje, Ang Dawa (Mingmar), Ang Nima, and Ang Pasang will carry the first of our two big ABC kitchen/dining tents up, and get it erected, then return to BC. These tents have heavy steel frames, to stand up to the weather at Camp 2! Meanwhile, Ang Karma, Ramji, Passang Nuru, with Sante and Bale (ABC cooks) will occupy Camp 2 and continue to work on tent platforms there. Sherpas Mingma Tenzing, Nima Karma, Phinjo Dorje, Tshewang Lhendup, and Mingma Dorje are moving to Camp 2, and will start fixing the Lhotse Face to Camp 3. Icefall climbers have now returned to BC from Island Peak, and will be at BC for a couple days getting ready for their foray up the mountain. So far so good! Expedition Leader Mark Tucker reports that the IMG Sherpas got 24 loads into Camp 1 today, with two sherpas continuing up to Camp 2 to nail down the IMG site up there before returning down. The Island Peak team was 100% successful in summiting IP and all are safely back at IP base camp. 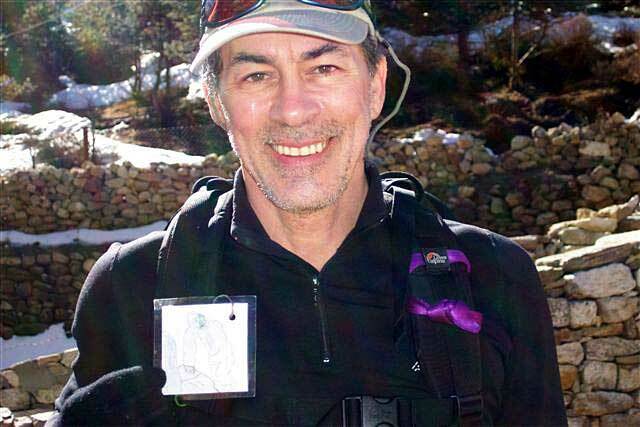 There was a birthday party for Sam, and Dave Hahn's trekkers headed downhill and on their way out today. Tucker says it was a little cloudy and chilly today, some light snow tonight. Plan is for about 16 or so loads to go up to C2 tomorrow, weather permitting, and then day after tomorrow if it all works out, the first rotation of Western climbers on the IMG team will head up to spend a night or two at C1. Base Camp is starting to really fill up now as more teams pull into town, and the BC heli pad built a couple of days ago by the members and sherpas, is now ready for use, if needed. 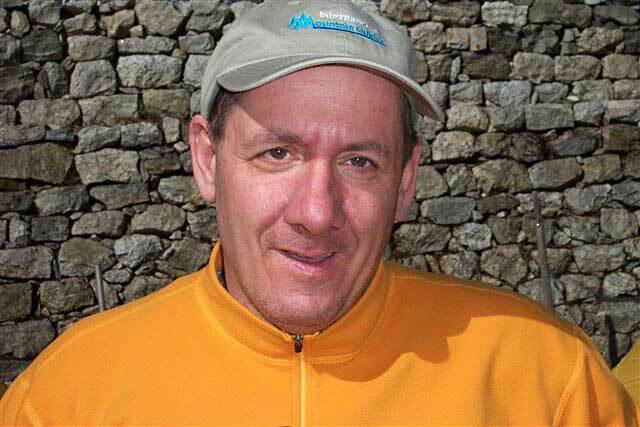 Ang Jangbu Sherpa reports that the two Mexican climbers, Fernando and Benjamin arrived base camp today (two days ahead of schedule) and seem to be doing well. The Ice Fall route has been put in to camp 1 yesterday. No movement in the Ice Fall today because of light afternoon snow yesterday. We have 24 Sherpas carrying to camp 1 tomorrow. Mingma Tenzing and Karma Rita will try to go all the way to camp 2 to claim our site. All is well here at Base Camp. Dave Hahn and his team arrived today on schedule and everyone is doing well. 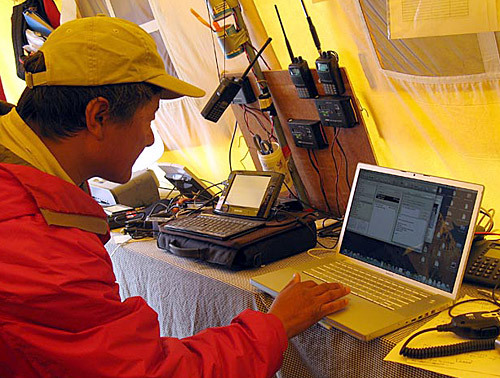 Island Peak team: We spoke with Casey and Mike this morning on Thuraya phone. 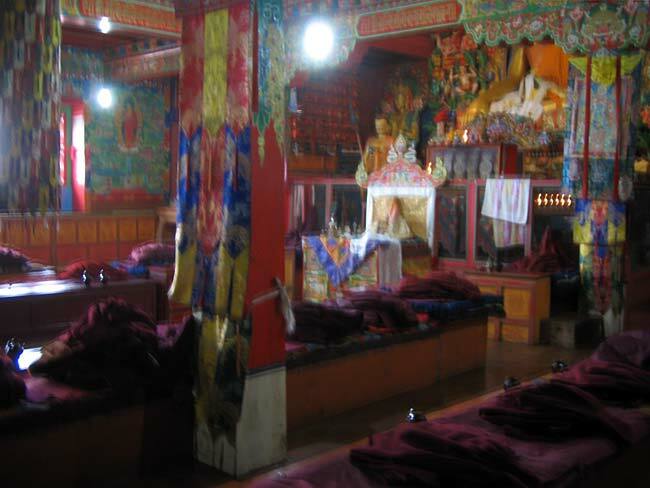 They are spending an extra night in Chukkung today, and will be moving up to IP base camp tomorrow. 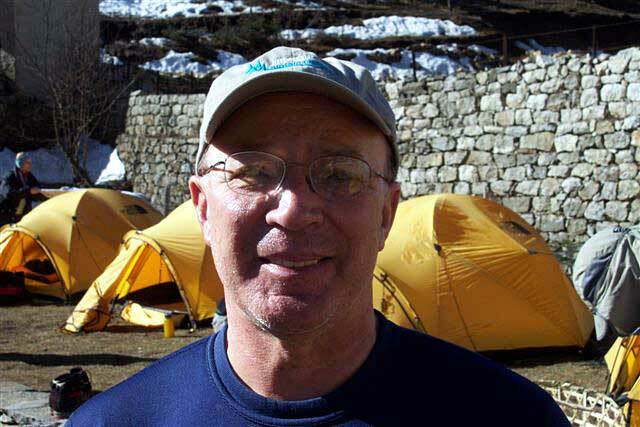 IMG Expedition Leader Mark Tucker reports from Khumbu Base Camp (morning of the 5th, Nepal time) that the team is getting ready for Puja Day  the start of the climbing! 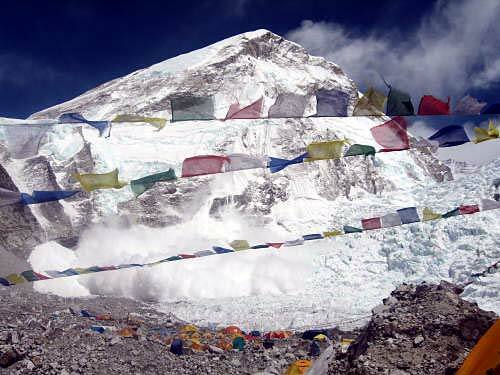 The Sherpas have built a large stone edifice that will support a pole with all the prayer flags. Around this will be stacked ice axes and crampons, the tools of the trade. This main flag pole will be erected after plenty of ceremonial chanting by the local lama, lots of prayers, and throwing of tsampa (barley) flour (which makes everyone look like they just emerged from a snowstorm). This will be followed by some beer drinking and general revelry with plenty of hand shaking and invocations of good luck. After lunch, the trekkers will depart Base Camp along with the Icefall and Island Peak climbers, with the goal being to get down to Lobuche today. Everyone is reported to be doing well and looking forward the the traditional beginning of the expedition!! The team made a sunset ascent of Kala Patthar last night, then hiked to Base Camp this morming from Gorak Shep. Typical spring weather  clear in the morning and cloud rolls in the late afternoon. Lot warmer than last year. Temperature right now is 20°F in the coms tent (no heater.) 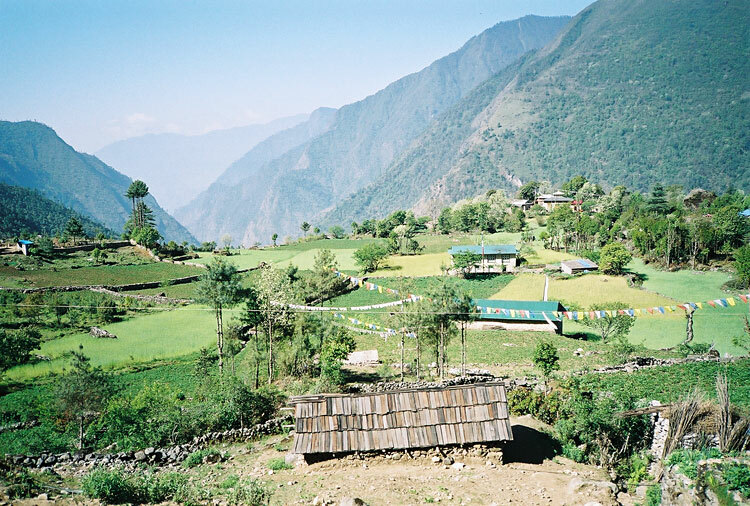 We haven't had snow or rain since since we were in Deboche. The Ice Fall Doctors think they can fix the route to camp 1 tomorrow (April 3rd.) We are having our Puja morning of the 5th. If the the ice fall route is through to Nuptse face, we are planning to send couple of sherpas to camp 2 to claim out spot on the 6th. 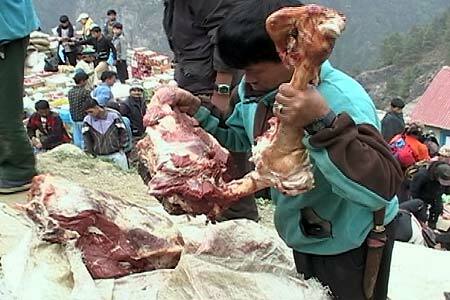 Rest of the sherpas will carry to camp same day. Everyone made it to Base Camp in reasonably good timing and all seem to be doing okay. 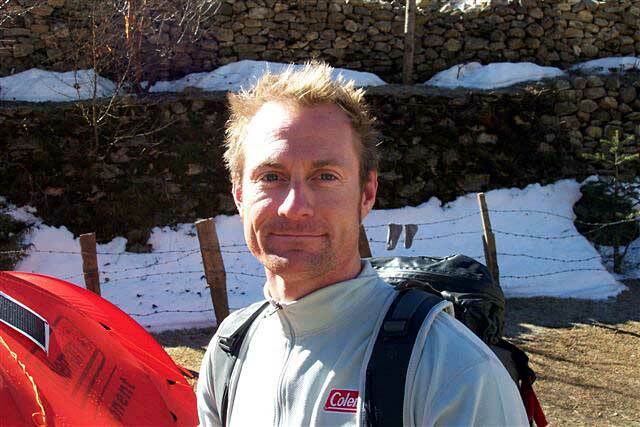 IMG Expedition Leader Mark Tucker called to report that the team had reached Lobuche, at about 15,000 feet. This is the last place that has any "green" (just a little grass in places)  beyond Lobuche it is all ice and rock. Today is a rest day. This morning deputy leader Ang Jangbu Sherpa hiked up to Base Camp and reports that the Sherpas have done a great job setting up all the big kitchen and dining tents, and the dozens of sleeping tents that will be required. 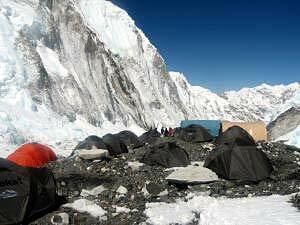 The Sherpas have been working on building this Base Camp for several weeks. Since the camp is on an ice-cored moraine (that is constantly melting) the camp must be rebuilt each year, and some of the tents may need to be re-set during the expedition. 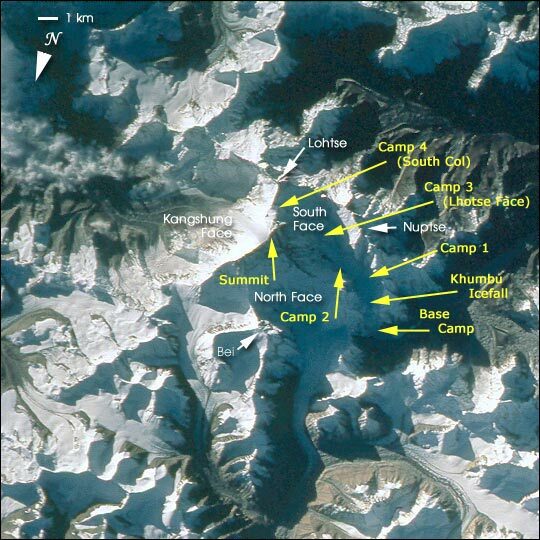 Tomorrow, the team members continues their acclimatization by ascending to Gorak Shep, the last campk before BC. 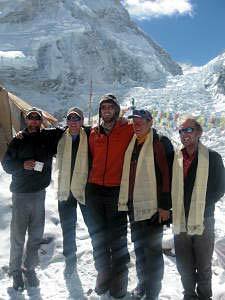 The following day they will climb Kala Patthar and continue on to Base Camp. 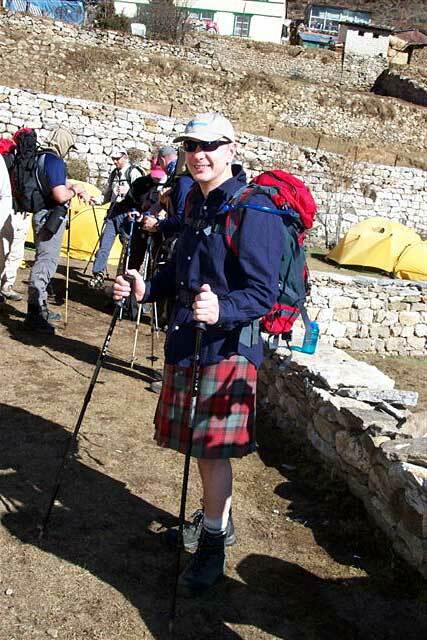 So far everything is going smoothly and the group is on schedule to arrive at Base Camp on April 2. Ang Jangbu and Mark Tucker called in via satellite phone to let us know that the IMG team is on track. 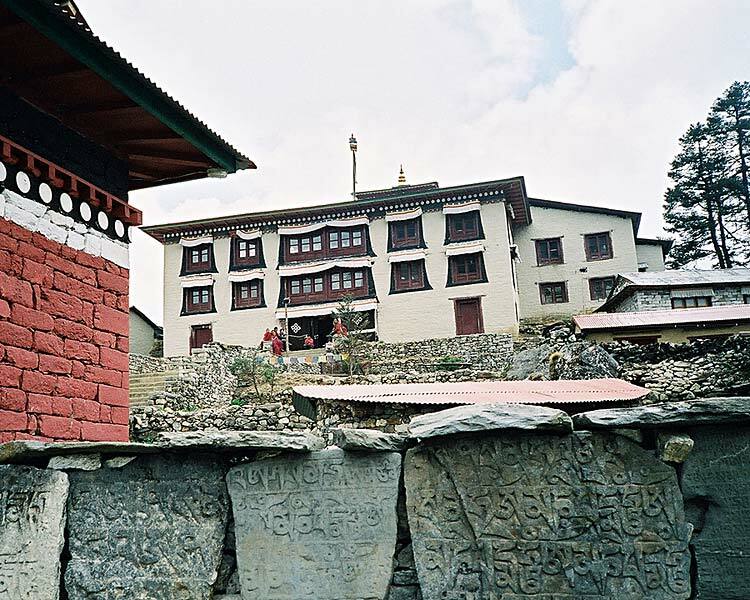 Today they visited and observed the religious traditions and ceremonial practices of the Buddhist monks residing in the monastery in Tengboche. The team will spend one more night at their camp in Deboche, then they'll trek tomorrow via Pangboche and will overnight in the village of Dingboche nearby. Work at Base Camp continues at fast pace as the sherpa staff prepare for the team's planned arrival there on April 2nd. 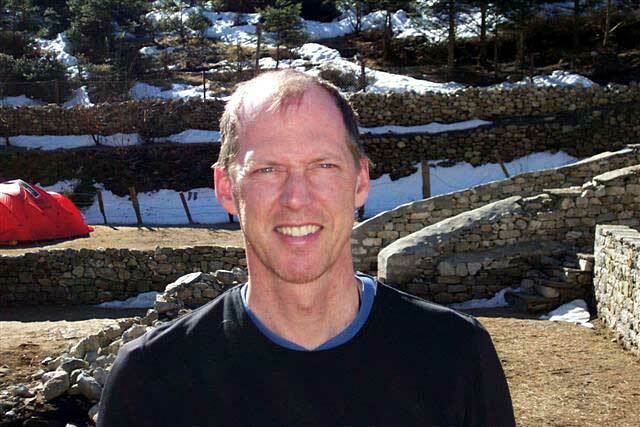 Eric Simonson emailed from Kathmandu, having trekked with the group to Namche and enjoyed his time getting to know this year's team members. 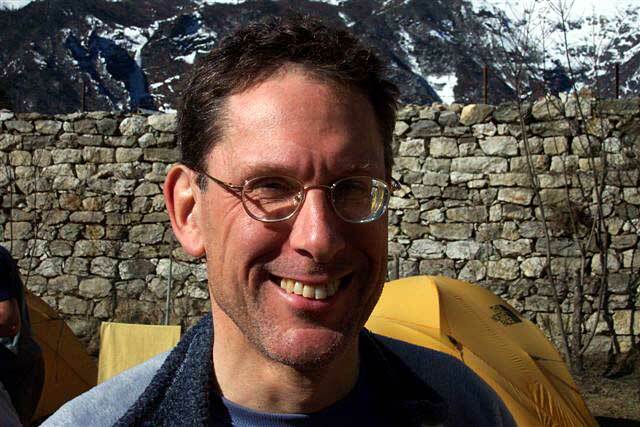 He oversaw the initial group meeting with the Sherpas in Namche, made introductions and honed the final details of organization for the expedition. 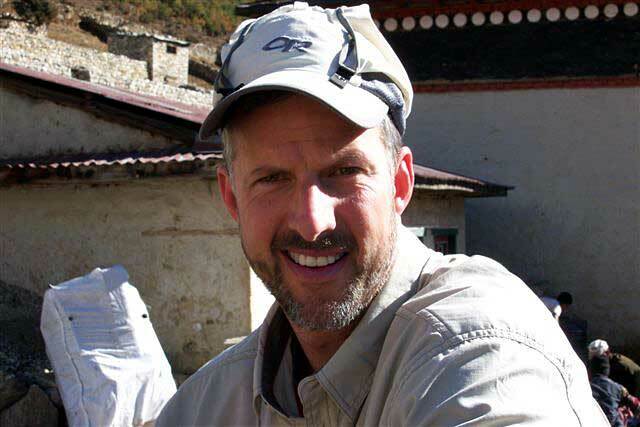 With all set in place, he's now heading back to the USA confident that expedition leaders Mark Tucker and Ang Jangbu Sherpa will carry on in fine fashion as they have in many past years for IMG. All systems are go! IMG's 445 yak loads are Base Camp-bound today, while the Everest expedition team was on the move to Deboche, trekking via Tengboche at over 12,600ft. and enjoying the vistas and the famous monastery site. 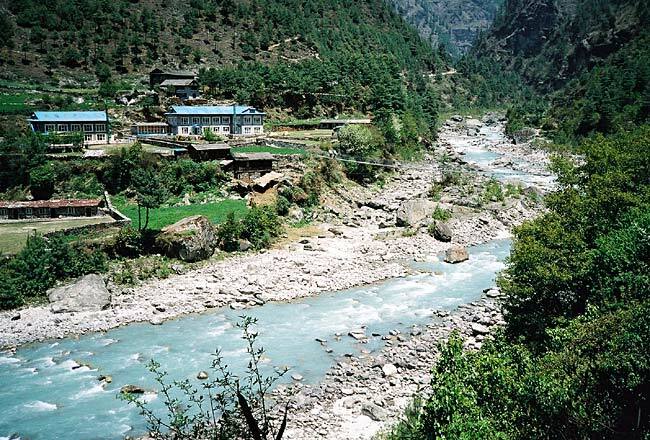 The Himalayan giants present spectacular scenery, including Kwangde (20,293ft. ), Tawachee (21,457ft. ), Nuptse (25,843ft. 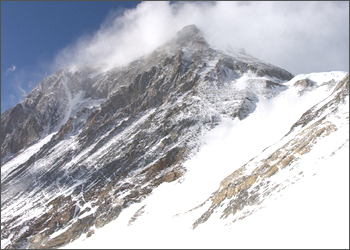 ), Lhotse (27,883ft. ), Ama Dablam (22,494ft. ), Kantega (22,235ft. ), Thamserku (21,674ft.) and of course Everest (29,035ft.) The team is camping in Deboche tonight (in a gorgeous yak pasture, but watch your step!) and will enjoy another day in the area tomorrow before moving on to Pangboche on Wednesday. 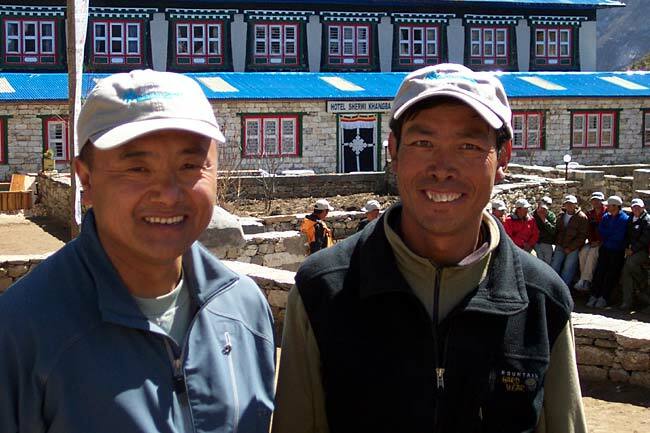 Many of the sherpas working with our team hail from Pangboche and the visit there is always special. A few folks on delayed starts are catching up with the larger group. 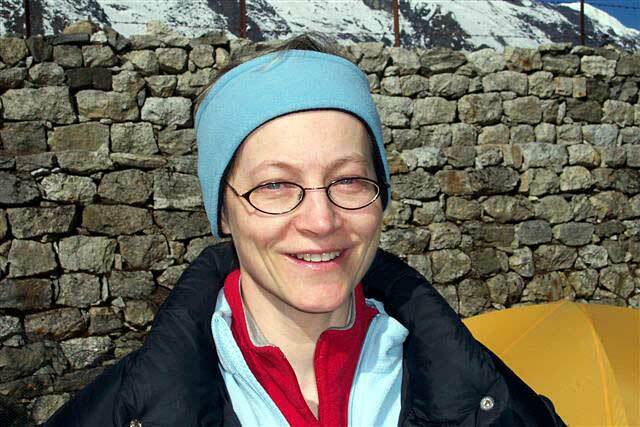 Dr. Luanne Freer, head of the HRA's Everest Base Camp clinic, has joined IMG's trekking group and she offered a great advisory session to the team on medical and altitude considerations as they move toward Base Camp and beyond. 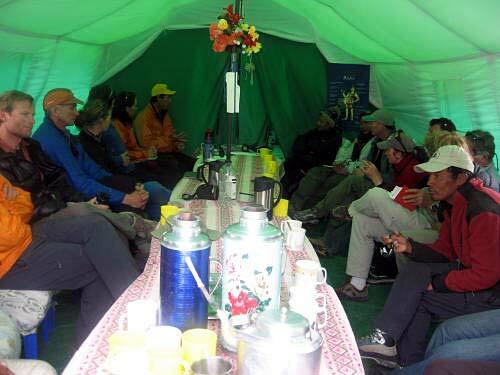 The Base Camp medical clinic has become an invaluable asset to the seasonal community of climbers with expeditions like IMG signing up for access to care and advisory services to sherpa staff and other team members for the duration of the climb. You can go to www.BaseCampMD.com and enjoy the often entertaining dispatches from their group throughout the season. 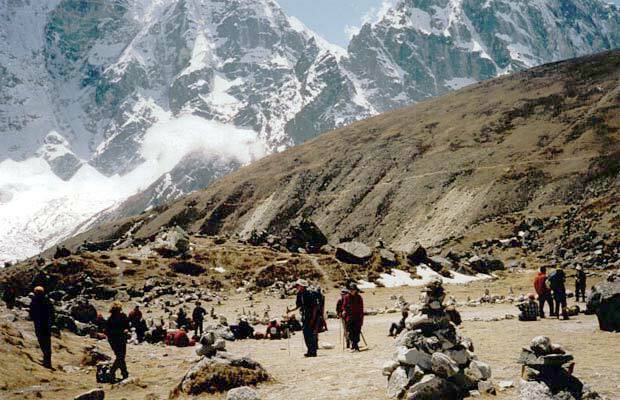 Interesting medical events every year, no question about that, plus lots of factual information about the altitude challenges that trekkers and climbers encounter in the region. The Nepalese greeting 'Namaste' (pronounced NAH-muh-stay) basically means 'hello' in Nepal, but technically translated by Buddhist monks means: "I salute the potential to become a God that lies within you." Either way, the team members of the 2007 International Mountain Guides Everest Expedition send their greetings to you and have asked us to keep you up-to-date during the course of what looks to be yet another great Everest season. The first wave of IMG staff and team members successfully arrived in Kathmandu, Nepal last week with only a few standard mishaps. Invariably, one or two duffle bags arrive a day or two later than their owners. 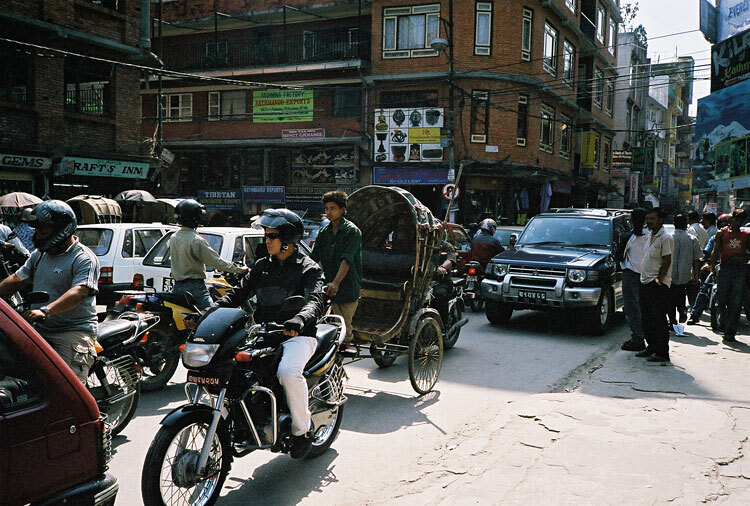 After a day to regroup and sightsee, the team decided to avoid possible delays from a predicted local commerce strike (these occur frequently in Nepal, you just take it in stride and work around it.) 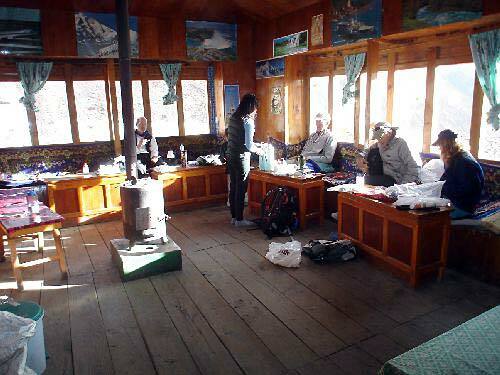 Everyone packed up quickly and flew to Lukla a day earlier than scheduled to begin the journey to Everest Base Camp. From Lukla, the team trekked uphill to Namche Bazaar, a popular trading village in the Khumbu region. 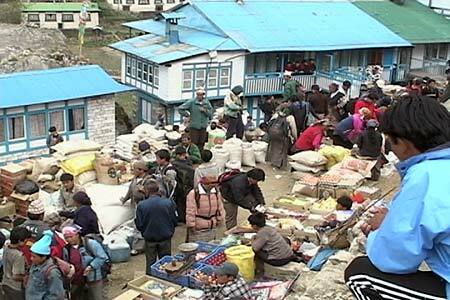 Namche represents a place where families from the surrounding hill country convene to exchange their own products for other items brought to market. The resulting 'bazaar' is an amazing array of regionally grown produce, livestock, dairy, textiles and crafts. As the Everest climbing and trekking season goes into motion, Namche becomes even more colorful and lively. The team members have spent a few great days in Namche sightseeing and visiting nearby villages and monasteries, but the time spent in Namche (at around 11,300ft. elevation) is also necessary 'acclimatization' during which the climbers' bodies begin to adapt to increasingly high altitudes. The time spent down low will translate to a much better chance of success up high. Behind the scenes but crucial to the team's success, IMG's Nepalese crew worked many long days to move the tons (literally!) 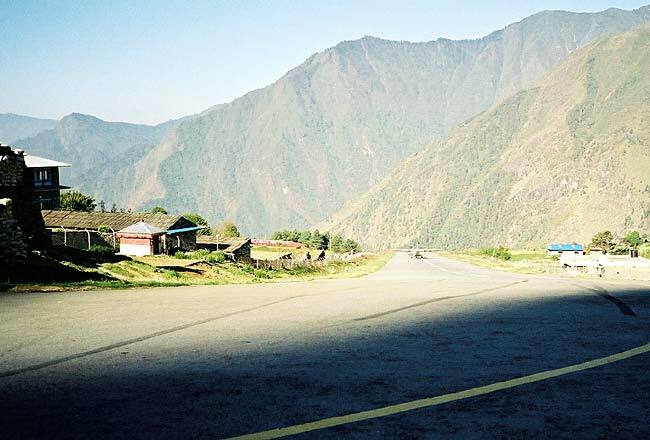 of expedition gear into shipments that found their way to Base Camp via air from the USA, helicopter into the Khumbu region, and then yaks and porters for the final journey into Base Camp itself. Meanwhile, more staff members are working away to build the foundations and erect kitchens, latrines, sleeping and dining tents and communications centers, creating 'flat ground' by chopping away at the rocks and ice of the glacial moraine below the Khumbu Icefall. We'll let you know when the team starts their move up from Namche. Next stop on their trek itinerary is Tengboche/Deboche, where the historic monastery, rhododendron forests and knock-your-socks-off vistas of Everest, Lhotse, Nuptse and Ama Dablam take center stage. We've still got a few folks en route to Nepal from around the globe, they're planning to arrive in Kathmandu in the next few days and they'll make their way uphill along the same route. We'll let you know when we hear from the team again, all seems to be on track, so until then, Namaste! IMG 2007 Everest Expedition begins! Each year is different, and 2007 has lots of unexpected twists and turns ahead for our Everest team. It is going to take a lot of hard work and good fortune to put a bunch of people on the summit  just remember, if it was a slam dunk, it would not be worth doing! Ang Jangbu Sherpa reports from Kathmandu that the Sherpa staff have now cleared the oxygen shipment, and are repacking it for transport by helicopter and yaks to Khumbu Base Camp. Unlike other companies, IMG fills all cylinders in the USA for quality control at each step of the process. This ensures 100% reliability for this vital life support system (unfortunately there is always the chance for operator error!). We now have a Sherpa team at Base Camp building tent platforms. On March 11 we sent out first helicopter charter to Syangboche with 109 yak loads of food and gear, and the Sherpa team is now at Base Camp working on building tent platforms and setting up the camp. We will send a second charter flight in a few days with the oxygen and more food, and a third flight after the team arrives in Kathmandu (on March 20) with members' duffels, fresh food, and additional gear. 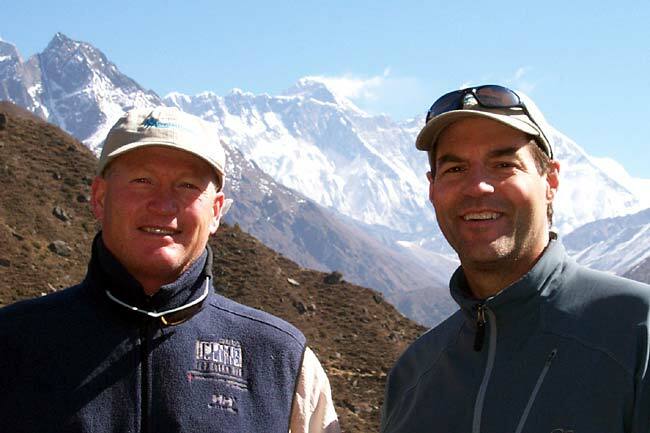 Our IMG team travels in several waves this year, with the main group flying to Lukla on March 22 with the Expedition Leaders Mark Tucker and Ang Jangbu Sherpa. 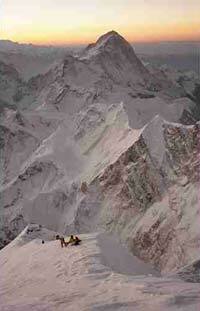 We expect that they will arrive at Base Camp about April 2, with summit bids likely starting about mid-May. 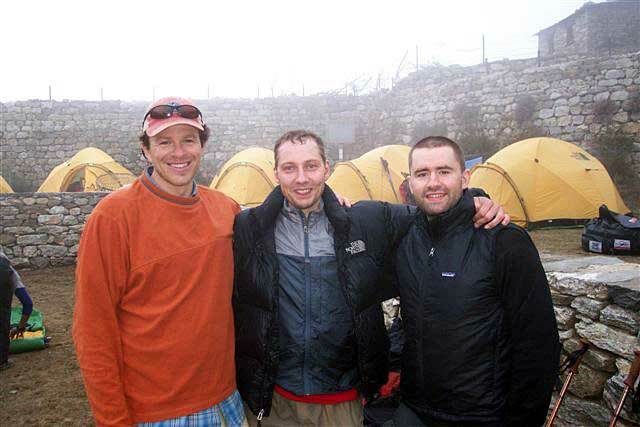 We'll look forward to sharing our 2007 IMG Everest expedition experience with you! Thanks to the various companies that supplied products and services for the 2007 IMG Mt. Everest Expedition. We appreciate their assistance!